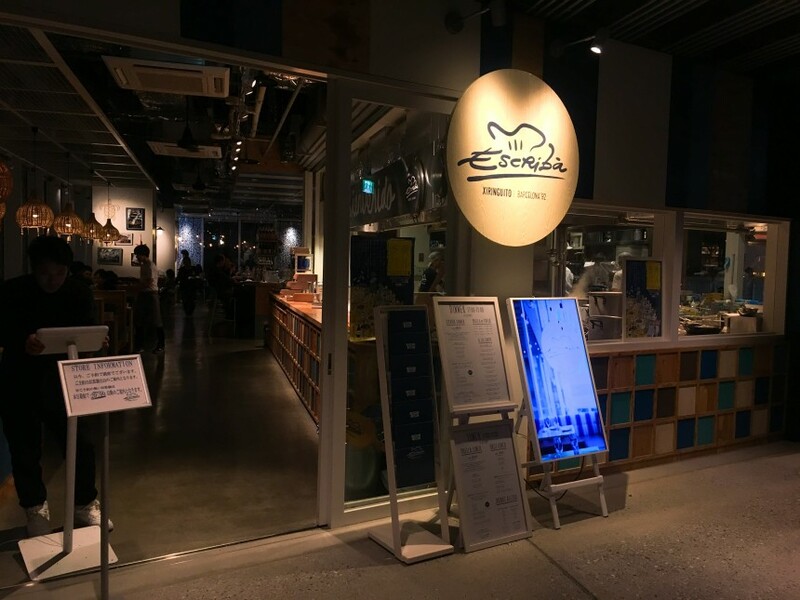 Barcelona-based paella restaurant Xiringuito Escribà has recently opened its first international location on the third floor of the Shibuya Stream complex. 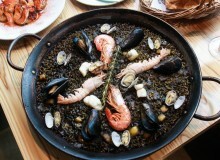 The original restaurant is described by many online reviewers as Barcelona’s best paella. Xiringuito (pronounced “chirin-gi-to” and meaning “beach house”) refers to the restaurant’s open, casual, beachfront location – a theme echoed in the location of the Tokyo branch. With a welcoming, open kitchen and large floor space overlooking the Shibuya Stream complex, the restaurant has a relaxed, welcoming waterfront feel. 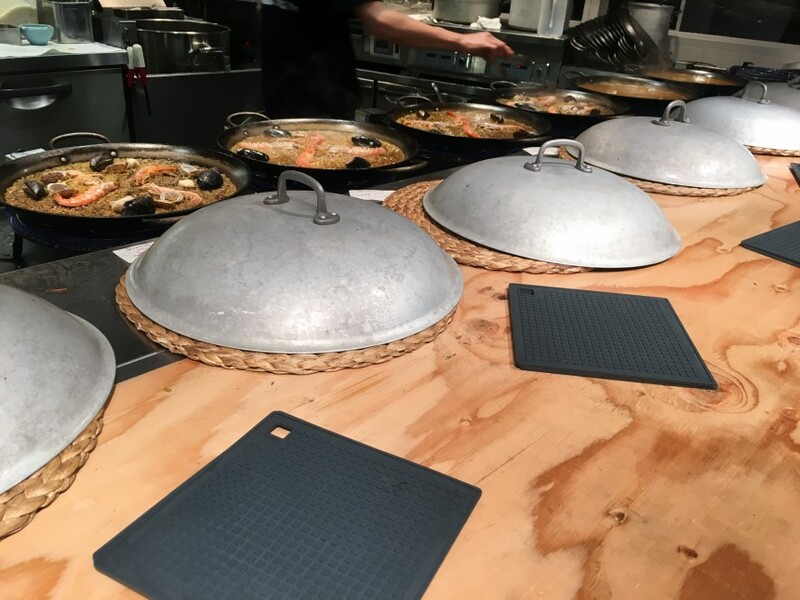 Guests who enter the restaurant are immediately greeted by the sight of a line of paella pans simmering at varying stages of readiness. The outer walls are windows; booths line these spaces, the large glass walls emitting a sense of openness despite the privacy characteristic of a booth. The decor is lively and turquoise-dominated. There’s a Mediterranean feel, with blue and white tiling and festive music. It is cheerful and family-friendly (with walkways wide enough to comfortably accommodate strollers). The focus of the menu is paella, but there are a number of smaller dishes available; tapas, seafood, meat and salads (vegetarian-friendly options also available; these are marked on the menu with green dots). As the featured menu item, there are four paella variations: Escribà (Japanese lobster, shrimp, clams and mussels), Valencia (chicken, white kidney beans and Moroccan green beans), squid ink (squid ink with shrimp, clams and mussels) and vegetarian (mushrooms, broccoli and Moroccan green beans). Choose from medium (two to three people) or large (four to six people) serving sizes. Housemade sangria (red, white, sparkling and sake) is also available. The dessert menu features a crema Catalana (like crème brulee, but Spanish) and a Basque-style cheesecake (crustless and cooked at a higher temperature). A single, tiny dish of green olives is provided to the table at dinner (note that a ¥500 per person charge is added to all bills after 5pm). 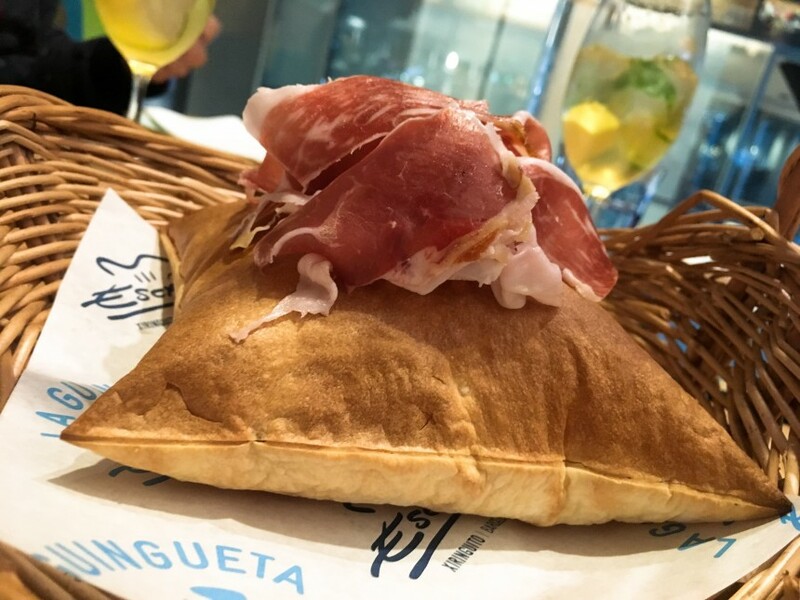 For an appetizer, the recommended “airbag” iberico ham is a visually interesting option; the dish is slices of prosciutto atop a crispy “inflated” pocket of bread. Break the “airbag” to eat the ham with the bread shards. While the prosciutto is pleasantly fatty and nicely salted, there is no option on the menu to order the meat sans-airbag, which means there’s no getting around the ¥1,800 price tag (enough for a couple of bites for two to three people). The Xató salad is the most intriguing of the three salad options — it’s a Catalan recipe wherein the sauce is key. The Xató sauce is made with a mix of nuts, tomatoes, oil and pepper that provides a slightly sweet and gently spiced base for tender cod (served cold). Endive, lettuce and tomato top the dish. From the tapas menu, the Spanish tortilla with salsa is savory and flavorful. The tortilla is served cold, but the flavors are bright; bits of ham and potato are intermixed with fluffy egg. The salsa topping has a good kick that makes the dish exciting. Paellas are delivered to the table with the cover on. Staff are clearly prepared to wait for customers to have their cameras ready to pull the cover off — this releases a cloud of steam, and makes for an entertaining reveal of the contents of the dish. Wooden spoons are the traditional utensil of choice for paella — thus, diners are given disposable spoons in a nod to the tradition. Xiringuito Escribà uses Valencia rice grown in Japan which has a very toothsome, almost pearl-like quality to it. The Escribà paella (the restaurant’s namesake dish) was visually pleasing, but was lacking on socarrat — the crisped bits of rice at the bottom of the pan (indicative of a proper paella – one that had been on a strong heat for the final phase of cooking). The rice layer was extremely shallow; the bottom of the pan was clearly visible when the dish arrived at the table. For three people, the medium paella was not adequate to fill stomachs, even following a few bites of appetizers and salad. 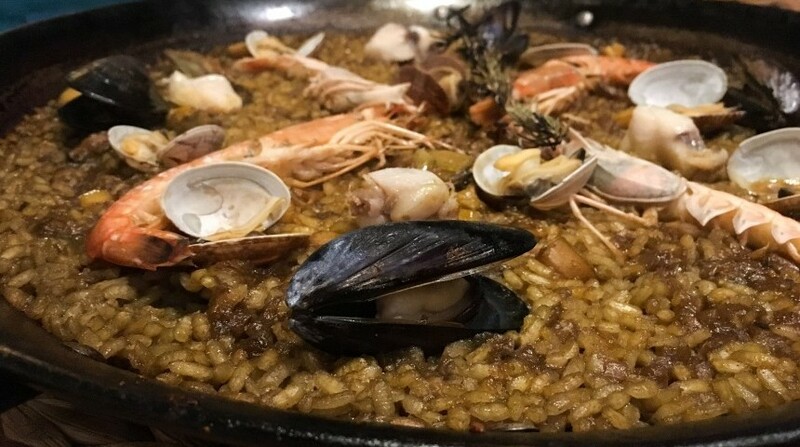 The flavoring of the rice in the paella was quite mild and, while the seafood portions in the Escribà were true to those pictured on the menu, the dish seemed to have more visual punch than flavor. At ¥3,400 for a medium size, something much more filling would have been greatly preferred. To accompany the meal, a glass of the white sangria was fresh, fruity and sweet. Sangrias can be ordered by the glass, in decanters and in pitchers. Though red and white wines are available by the glass on the menu, there are no listed bottle options. From the location one can derive that this is a family-style restaurant with Spanish food as the focus. 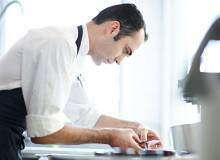 The prices are prohibitively high for young people and portions are extremely modest. An early dinner for three people cost approximately ¥4,000 per person (including the ¥500 table charge), but was not filling. This would not be an easy location to visit solo (the lunch menu is composed of the full range of paella options and a scaled-down appetizer menu). While the smaller items on the tapas menu present some interest, the focus seems to be on the visual appeal of the paella. 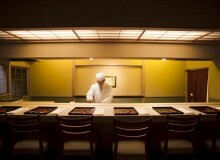 Reservations are recommended, as the location is new and is experiencing a wave of interest. Call the restaurant directly, as the reservation information on the restaurant’s homepage is not reflective of actual availability. Visit before 5pm to avoid the ¥500 per person table charge. 3F Shibuya Stream, 3-21-3 Shibuya, Shibuya-ku. Lunch: 11am – 5pm, Dinner: 5pm – 11pm.